Are you better off than you were four million years ago? 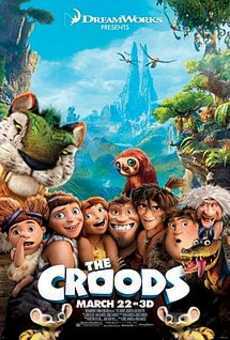 That’s the evolutionary question playfully posed by The Croods, a visually-captivating, action-oriented cartoon revolving around an agoraphobic clan of cave dwellers that summons up the courage to abandon their home in the face of impending climate change. The enchanting message movie was co-directed by Kirk De Micco (Space Chimps) and Chris Sanders (How to Train Your Dragon) who assembled an ensemble featuring Nicolas Cage, Emma Stone, Ryan Reynolds and Cloris Leachman to breathe life into a colorful array of prehistoric characters. Besides the talented voice cast, the film makes a most effective use of 3-D technology guaranteed to keep the tykes enthralled for the duration, whether they’re ducking projectiles aimed directly at their heads or trying to touch objects dangling just out of reach. The other members of his primitive brood include naggy mother-in-law Gran (Leachman), long-suffering wife Ugga (Catherine Keener) and their three kids: feral baby Sandy (Randy Thom), man-child Thunk (Clark Duke) and rebellious teen Eep (Stone). Grug feels it is his duty to remind them on a daily basis of the many dangers lurking just beyond the entrance of their boulder-fortified abode. That’s why he’s so fond of telling bedtime stories in which any curiosity about the outside world invariably proves fatal. Grug’s scare tactics work until the fateful day Eep sneaks off to explore on her own only to encounter a boy (Reynolds) about her own age. Not only has handsome Guy figured out how to harness fire to keep hungry creatures at bay but he forecasts imminent doom for any humans who fail to move to higher ground. When Eep brings word of this frightening development to her Neanderthal of a dad, it becomes abundantly clear that it’s going to take more than a little convincing to get him to lead the family out of the cave on a perilous trek to safety. Mother Nature plays a part in nudging him to grudgingly join forces with Guy, and the ensuing sojourn across a vast wasteland to Shangri-La allows for a priceless lesson about risk-taking as relevant in the 21st Century as it must have been back in the Stone Age. A side-splitting, thrill-a-minute adventure reminiscent of the best of The Flintstones. Wilma!